KitMonsters – Marshall JCM 800. The music makers’ guide to making music. 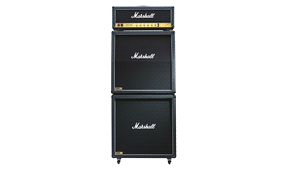 Part of Marshall’s vintage series, the JCM 800 is based on their legendary ‘Plexi’ head. At 100 watts this all valve head was one of their first amplifiers to have a Master Volume control. A one channel amp with no reverb or built in effects, it is the essence of simplicity, capable of producing pure tube tones without anything that might compromise them. The reissue has a series effect loop with a true bypass switch allowing a bit more flexibility, but also nothing to get in the way of the tone purist.